¶ 1 Leave a comment on paragraph 1 0 Legend has it that Robert Johnson, the bluesman extraordinaire, sold his soul to the devil in exchange for an otherworldly talent for playing the blues. I suppose that was the only way his contemporaries could explain how it was possible for Johnson to suddenly transform himself from a rather ordinary bluesman into a certifiable genius in such a short time. ¶ 2 Leave a comment on paragraph 2 0 Either Dylan made his own deal with the devil or he is living proof that an extraordinary person can indeed make a great leap forward very, very quickly. The Dylan of 1961 was a competent performer with some flair and imagination. By 1962 he was suddenly the genius working in the folk music genre. The transformation is stunning. ¶ 3 Leave a comment on paragraph 3 0 The first album had only two original songs, neither of which would be remembered today if Dylan hadn’t gone on to do much better things. 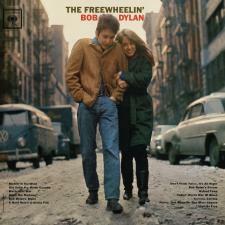 Freewheelin’ has twelve originals. Blowin’ in the Wind and A Hard Rain’s A-Gonna Fall will certainly be remembered as classic American folk songs. At least two others, Don’t Think Twice It’s All Right and Girl of the North Country, are not far behind. Oxford Town brilliantly introduces the civil rights themes that Dylan would focus on with his next album. Master of War is Dylan’s first great “finger pointing” song. Several of the other songs reveal Dylan’s under-appreciated razor sharp wit. ¶ 4 Leave a comment on paragraph 4 0 Years ago I had an older professor for a computer science course who would often forget about the bits and bytes and go off on long entertaining tangents, often reminiscing about his younger days. One day he was talking about the sixties and recalled his introduction to Dylan’s music. He said was driving down the road when Blowin’ in the Wind came on the radio. It was the first time he had heard it. Astonished by the power of the song’s lyrics and the strength of the singer’s voice, he was so overcome with emotion he had to pull his car off the road. His hands were actually shaking on the wheel. It was several minutes before he could continue on his way. That is the kind of performer and writer that Dylan had become. ¶ 5 Leave a comment on paragraph 5 0 Dylan originally planned for the second album to be pretty similar to his first. The original title was Bob Dylan’s Blues. A sudden burst of creativity led to the last second inclusion of four new songs: Masters of War, Bob Dylan’s Dream, Girl of the North Country and Talking World War III Blues. These songs replaced Talkin’ John Birch Society Blues, Gamblin’ Wille, Let Me Die in My Footsteps, and the traditional Rocks and Gravel. With the possible exception of Let Me Die, the new songs were demonstrably stronger than the songs they replaced. (I would have suggested including Let Me Die instead of Bob Dylan’s Dream if Dylan had asked my opinion.) The originally planned recording was actually released for a brief period and is now highly collectible. See the Searching for a Gem web site for detailed information on the history of the original recording. ¶ 7 Leave a comment on paragraph 7 0 Dylan actually “went electric” on this recording, well before his controversial performance at the 1965 Newport Folk Festival. Dylan is quietly backed by electric instruments on Corrina, Corrina. But two outtakes, Mixed Up Confusion and That’s Alright Mama, are the real story. Both were done in a driving rockabilly style that clearly demonstrates the influence that early rockers such as Little Richard and Elvis Presley had on the young Dylan. (That’s Alright Mama was an early hit for Presley.) As hard as it is to believe now, Mixed Up, which is included on the 1985 Biograph collection, was actually released as the first single from Freewheelin’. ¶ 11 Leave a comment on paragraph 11 0 Perhaps Freewheelin’ isn’t as consist as some of his other great recordings like Bringing It All Back Home or Highway 61 Revisited. It was recorded over a relatively long period of time and contains several different musical styles, so maybe it’s a bit less coherent. But it’s a great record, containing several his all-time best songs and some brilliant performances. ¶ 12 Leave a comment on paragraph 12 0 A little trivia: Bill Lee – father of the popular filmmaker Spike Lee – played bass on several of the unreleased tracks. Thanks Stan! that’s EXACTLY the type of comments I was hoping for. I bookmarked your site.